Lendy (formally known as Saving Stream) offers investment in loans secured against property, with a max LTV (loan-to-value) of 70%. For borrowers (typically property related businesses) they provide bridging loans and development finance via the sister site Lendy Finance from 0.65% per month. They have grown quickly and are now one of the larger P2P platforms, with more than £266million lent out to date. Cashback: No offers at the moment. Innovative Finance ISA: Not Yet. Note: at the end of March 2017 Saving Stream rebranded as ‘Lendy’. This review still calls the platform ‘Saving Stream’, but is relevant to Lendy as nothing much has changed to how the platform actually works. 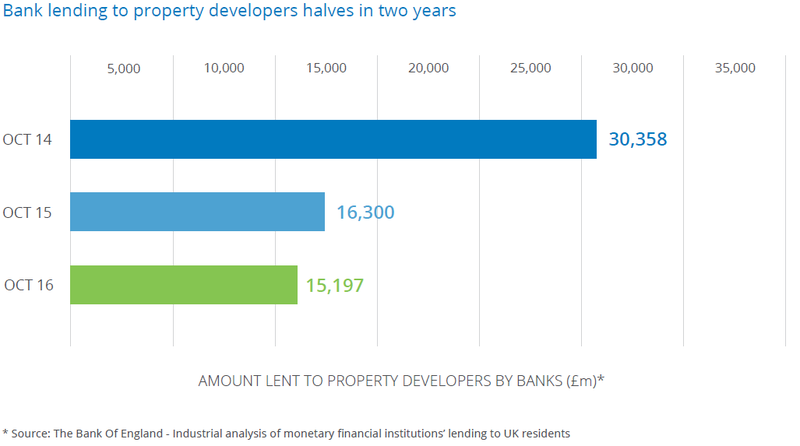 Borrowers need short term capital for property development or bridging loans, and it makes sense for them to borrow from Saving Stream when mainstream banks are pulling back from this sort of lending. Loans do not come that often, a handful a week, but they are generally quite large. 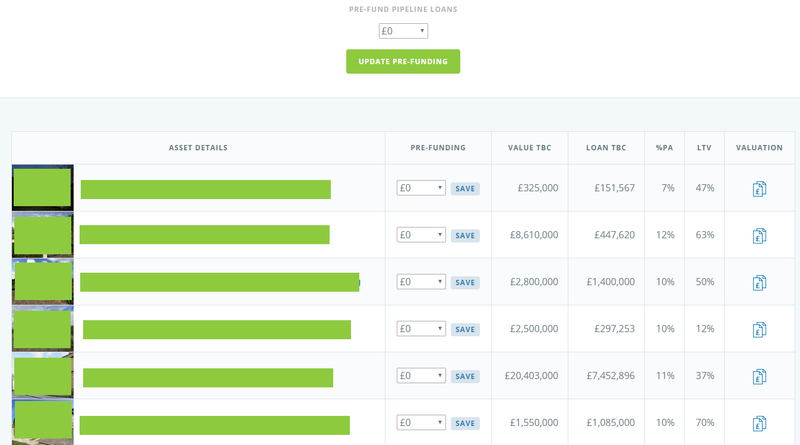 When I look at the pipeline now, I see six loans ranging in size from £150k to £7.5 million. Because there’s not so many loans, I find myself doing more in depth due diligence and investing larger amounts per loan than say Funding Secure or Funding Circle. Screenshot: Saving Stream’s Pipeline page. I’ve greened out the asset details to avoid sharing private info. Saving Stream uses a pre-funding mechanism to invest in new loans. There is a pipeline page on the site (screenshot above) with potential new loans. The day before a new loan ‘goes live’ you get an email reminding you to update your desired pre-fund amount. They then use this to allocate the loan with a ‘bottom-up’ model. So, if you have a £1 million loan, 5 people pre-bid £100k and 5 people pre-bit £200k, the bottom-up method means everyone gets £100k. An alternative pre-bid method used by other sites is a ‘scale-back’ where everyone would get an amount scaled in the % that they pre-bid. In practice, the scale-back method means that everyone over-bids in the expectation of only getting a small % of what they asked for. Saving Stream’s bottom-up method is good because it stops this race to the top in over-bidding. Saving Stream uses an ‘Invest Now, Pay Later’ on pre-bid loans. So, you wait to see how much you are allocated before having to deposit the money. In the past I used to deposit in advance: I didn’t want to risk late payment. However, occasionally Saving Stream have announced go-live’s that get delayed. So now I wait until actually seeing my balance go into the red before depositing money. You can only make secondary market purchases if you have the funds in your account beforehand. When I first joined, all loans were at 12% interest but in late 2016 Saving Stream introduced lower rates of return. Saving Stream suggested this was to allow them to take up opportunities in lower risk, lower return loans. Why not offer lower rate products if there is demand from borrowers and lenders alike? 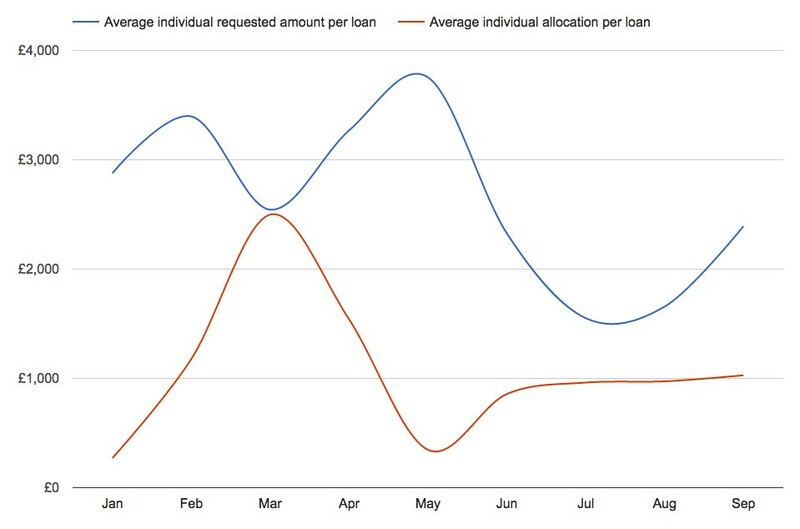 The chart above shows the difference in lender and borrower demand during 2016. This was part of Saving Stream’s motivation to introduce sub-12% loans. The July dip coincides with the Brexit vote at the end of June and which sparked a temporary respite in lender demand. According to Saving Stream, there was the potential to lend out an additional £25 million in September 2016 if they had the flexibility to offer lower rates. At the time the change was introduced, some private investors suggested it may have been to take a larger profit margin from the highest demand loans. Regardless, several months on there is still a stream of 12% loans and you can choose to invest where you like. Deposits and withdrawals are processed once a day during the week and occasionally at the weekends. With the bidding mechanism for new loans that allows you to deposit funds after, it’s not quite as urgent as other platforms to have anything more frequent than this. One of the great things about Saving Stream is the online lender community. Usually whenever I get the email about a loan go-live, I check the P2P Independent Forum here aswell as the documentation on the Saving Stream website. The exact loan titles are ****’d out on the P2P forum for privacy reasons. Often other investors will spot something you might not have noticed, and for beginners it’s a great way to learn what other investors look for. There is a particular user on the forum called Cooling_Dude that shares excellent notes on every new loan, but was reigned in by forum administrators for providing too much information. There are no fees to sell a loan-part on the secondary market, but you don’t earn interest while your loan is for sale. Liquidity is usually very good, most loans sell within a minute or two, but this depends completely on investor confidence and is not something to be taken for granted. To cut down on the use of automated scripts (‘bots’), Saving Stream put in a captcha code that you have to answer before buying a loan part on the secondary market. It’s been a long time since I bought anything on the secondary market (it’s too fast for me), but I remember some sort of trick. I think if you open a loanpart in a new window, solve the captcha in advance, refresh the original loan overview window until something becomes available, then go back to the loanpart page you do not have to solve the captcha again. No guarantees this still works! We have updated our policy on defaults and secondary market rules. Our previous default policy was not formalised or publicised widely, so now borrowers and investors will have more clarity on how defaulted loans are managed. A loan will be deemed to be in default if the amount owed is not paid within 180 days, which Saving Stream is calling a tolerance period. Interest will still be paid for the first 90 days of the tolerance period, but after that it will be accrued but not credited until the underlying security is sold. The final interest credit will depend on the repayment secured from the asset sale. The borrower may also get a loan extension if they are able to provide funds to pay the interest owed within the tolerance period. There’s two types of loans on Saving Stream: DFL (Development Finance Loan) and PBL (Property Bridging Loans). DFL loans come in several tranches (portions, released over time). These are often large developments where the value of the site increases over time. Saving Stream commission regular inspections of the development to confirm the increase in value before releasing the later tranches. This works well for the property developers, who can continue to fund their ongoing project. In my opinion from what I’ve seen recently, the DFL loans have a higher rate of return. Its also nice to know that there are further tranches coming up: if you don’t have spare cash available to offer this month you’ll probably have another chance to invest. The PBL loans tend to be one-off loans, either for development or perhaps for a borrower who needs short term finance as they look for lower rate long term finance. I’ve heard a couple of people mention a bug with deposits. They said if they made two deposits of the exact same amount on the same day (e.g. 2 deposits of £2,000) then it would only go through as one deposit. I’ve no confirmation at all if this is true, but to be on the safe side you could add in a slight variation, e.g. £2001 and £1999. The two options given, TransferWise and CurrencyFair, were the two cheapest options for larger transfers that I found in a recent review of low-cost money transfer services. 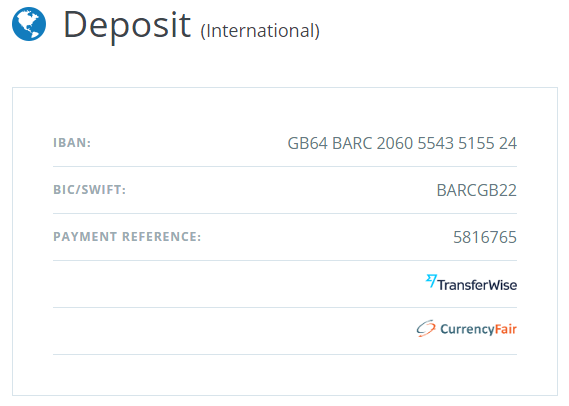 TransferWise have a flat fee of 0.5% against the market exchange rate, with a £2 minimum charge. CurrencyFair have a €3 flat fee but have an additional spread from the market exchange rate. Read more in the low-fee money transfer article. Saving Stream is one of the larger UK peer-to-peer lending platforms. They offer higher return investments backed with a discretionary provision fund. The pre-bid and invest now, pay later system makes it less hassle than other manual investment platforms. 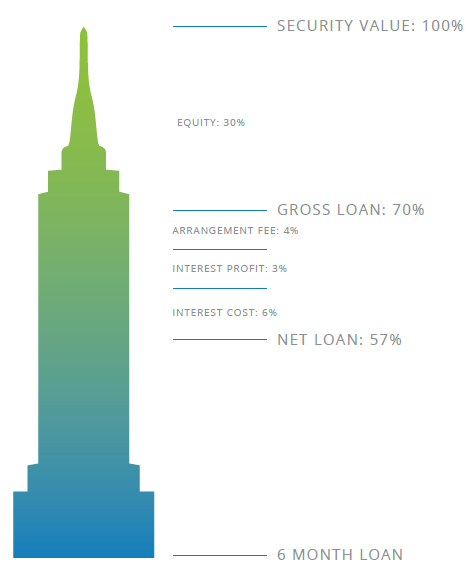 I think they have a nice balance with the volume of new loans: small enough to have a closer look at each one but large enough to offer ongoing risk-reward opportunities for most experienced investors. I think that it’s important to do due diligence on every loan and there can be some difference in risk even with loans paying the same % interest to investors. The main criticism would be on the decline in the number of 12% loans, but at least for now there is still a steady pipeline. Also for new members looking to diversify their investments, the secondary market is definitely a seller’s market and you’ll struggle to beat the fastest fingers. New investors may find it easier to just be patient and invest in new primary market opportunities as they become available. Totally agree with you about the secondary market, I rarely use it.. But otherwise I think it’s very good,. The advance email on each pipeline loan makes it easy to put in a bid and get the covering cash in if needs be (they give you 24-hours grace). Apart from the slide in returns from the once standard 12%, my only gripe is that they seem to be making no effort to offer an IFISA, which means only a small portion of my money will go there in future. Last week they launched some bond products: 1 year at 5% and 3 year at 6%. Perhaps these will be the IFISA offering once they get it up and running? Just a hunch! There have been a few recent negative changes to the SavingStream platform, I have a very broad spread of loans but currently around 40% of them are in arrears so interest payments are “accrued”. Presumably there is a pot of cash building up somewhere so it will eventually works its way through, but there is no visibility of these accruing payments so all I see is an overall reduction in the value of interest payments. In addition, they have removed the ability to interrogate transaction history beyond 1 month so it is very difficult to get a clear picture of what is owed. I have written to them expressing concern with limited sympathy but I’m sure I’m not the only person with this issue. Hopefully they will make some changes to make the accrued payments more traceable but currently a bit opaque. Same problem as Frazer, the platform has changed dramatically with many loans going into default and late , they have a policy of a so called grace period of around 180 -days , far too long and with hold interest payments to lenders. Another issue is the secondary market now, its saturated with lenders wanting to sell, therefore you can wait forever to try and pull some money out. I have challenged their Due Diligence policy as being woefully inadequate which has allowed some very suspect people / companies to obtain large loans, in addition Lendy always seem to have addition issues and reasons not to pay-out lenders. Personally i have stopped lending to this platform and currently have around 16 loans in default and several late , this is around 85% of my loans, this is an extremely high percentage and not the norm with other platforms.